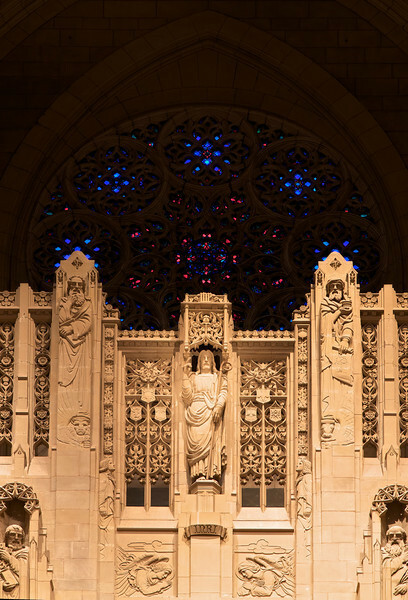 The focal point of the interior is the limestone reredos, designed by Earl N. Thorp and carved by Edward Ardolino, which rises 50 feet behind the altar and frames the rose window. John Gordon Guthrie (1874–1961), a Scottish immigrant, known professionally as "J. Gordon Guthrie" designed the rose window. Guthrie had first designed windows for Tiffany Studios. He left Tiffany in 1906 and worked for Duffner & Kimberly until 1914. The New York City company produced leaded glass and bronze lamps at approximately the same time as Tiffany. He then worked with Henry Wynd Young (1874–1923) until Young's death in 1923, when Guthrie took over the management of Young's studio. Guthrie began his own firm in 1925, and was active as a stained glass designer until his death on June 23, 1961, according to Wikipedia.